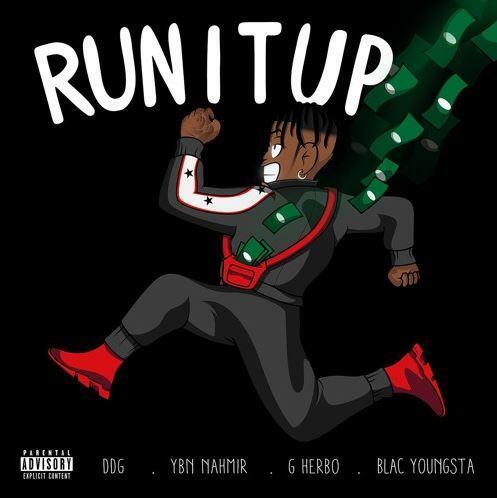 YBN Nahmir, G Herbo & Blac Youngsta Jump On DDG's "Run It Up"
Home>New Songs>DDG Songs> YBN Nahmir, G Herbo & Blac Youngsta Jump On DDG's "Run It Up"
DDG links up with YBN Nahmir, G Herbo and Blac Youngsta for his new cut, "Run It Up." DDG's been making noise for a minute which ultimately landed him a record deal with Epic Records in June. Since then, the Michigan-born rapper's been dishing out new music and proving that he's one of the most promising young artists to emerge this year. Today, the rapper reaffirms that by releasing his new single, "Run It Up" featuring G Herbo, YBN Nahmir and Blac Youngsta. DDG connects with some of the hottest rappers out right now for his new single, "Run it Up." It's an uptempo cut that finds DDG holding down an infectious hook before dropping some tough bars alongside Blac Youngsta, Nahmir and G Herbo. "It’s dope to see all these artists that’s at the top of the game come on to my track and turn it up," DDG told Complex about the collaboration. "It makes me feel like I’m in the music game forreal now. We gon' run it up together." Nahmir revealed that he's known DDG for a minute and their collaboration is simply a matter of perfect timing. "DDG is the homie, we’ve known each other for a minute and I remember when he first started making music, so the timing for this record was dope for us to finally work together," Nahmir said. Xzibit, B-Real, & Demrick Prep The Kill Room On "Get Away With It"
$uicideBoy$ Share New Song "HUNG UP ON THE COME UP"
SONGS YBN Nahmir, G Herbo & Blac Youngsta Jump On DDG's "Run It Up"